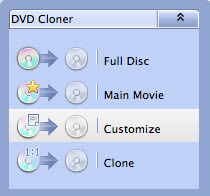 Any DVD Cloner Platinum for Mac provides ultimate solutions to backup DVDs on Mac as DVD files, to blank discs on DVD-R/RW or DVD+R/RW, convert DVD to videos for playable on popular mobile devices. Four backup modes, three video formats with customized settings, more than ten mobile devices options can be selected for various needs. Note: It's recommended to use Lowly Enhanced or Highly Enhanced Open Method which may help you to find the exact real longest title among a list of potential fake titles in some latest DVD movies with special copy protections. Click the Source option to choose the DVD drive or DVD burner where your DVD movie has been inserted into. Then program will start scanning and analyzing the DVD movie. All titles will be listed in the program. Note: If you have more than one DVD drive, you can choose another drive in "Target" for copying DVD to blank disc. If you have only one DVD drive, just choose the same DVD drive to "Source". Burning a DVD to DVD/ISO Image File/DVD folder, temporary hard disk space will be required. If there is not enough temporary hard disk drive, DVD backup may fail (Tips: Temporary Folder can be changed by clicking "Any DVD Cloner Platinum" on menu bar -> "Preferences"). For burning a DVD9, 8GB free space in hard drive disc is required. If the output DVD folder or ISO image is in the same drive as temporary folder, 16GB will be required. 1.4 Choose DVD Backup Mode. Full Disc: Entire movie DVD will be backuped to DVD or hard disk (DVD folder & ISO image). Main Movie: Only the longest title will be copied. Customize: Select any title or chapter you want to backup. Clone: Burn DVD to DVD directly in 1:1 ratio. Multiple DVD-ROMs are necessary and the target DVD drive should have burning ability. 2. How to Convert DVD to MP4/M4V/MKV on Mac OS X? 2.2 Open DVD to load DVD titiles in the program. 2.3 Choose output video saving folder in "Target" or the temporary folder will be selected by default. Please make sure it is a folder with sufficient space to save a video file converted from the original disc. 2.4 Go to "Convert" panel and choose your output device from the list. 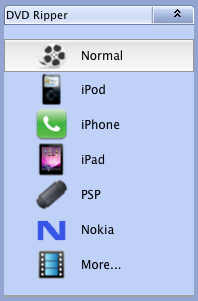 You can choose "Normal" if your portable device is not listed. MP4 would be selected in "Output Format" for "Normal". 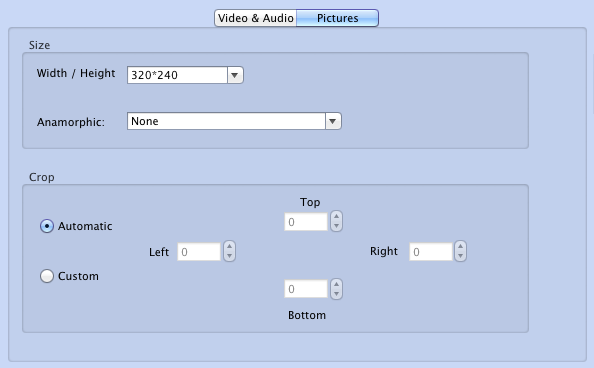 Users could click the drop-down button to select "MKV" or "M4V" as output video format. 2.5 Choose the titles to convert. 2.6 Click to customize audio & video or picture parameters. Sample rate: Set audio sample rate (KHZ). With above customized settings, users can get the perfect output video for playable on their portable devices. 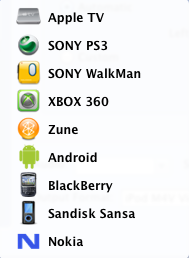 Users also can just leave all settings by default suppose the portable device is selected in the list. 2.7 Click to start the conversion. It should take less than 3o minutes for converting a two-hour DVD movie. Therefore, users just need to wait for a while, the target folder will popup automatically and the video file will be selected by default. Transfer or synchronize the converted output video file to portable devices like Android smartphones, Android tablets, iPhone, iPad, iPad mini etc. Then you can watch the movie freely on the go. Suppose users find the frame size of the output video is not perfect enough when playing on portable device, should go to "More Settings" tabs to modify the parameters. 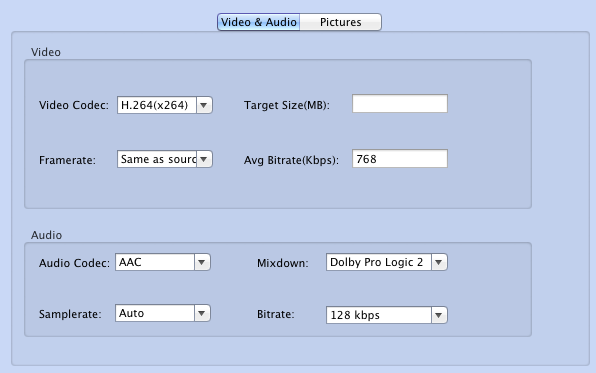 Choose or input appropriate frame size in perfect ratio, and make sure other parameters like bitrate, etc should be modified meanwhile.